You might recognize the design below that I used for my Christmas card this year. 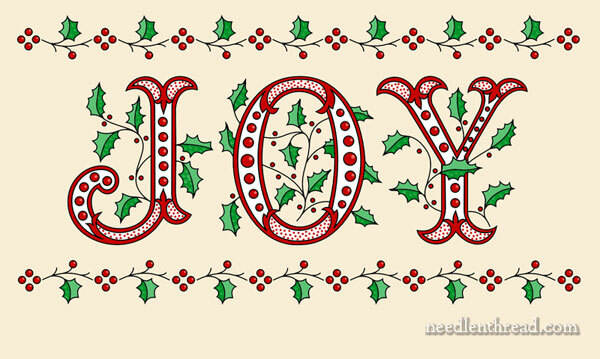 You can find several printable versions of Holly & Joy here. 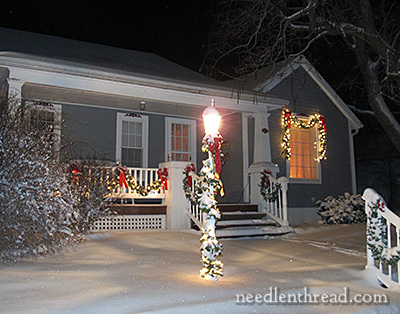 Tomorrow, I’ll be off visiting family, leaving Needle ‘n Thread unusually silent! But before I take off, I wanted to pop in early to wish you and yours a Christmas full of joy, true peace, and many blessings! From my house to yours – wherever you are – a very Happy Christmas! December 25, 2016 Merry Christmas 2016! Merry Christmas, Mary, to you and yours. And a very Merry Christmas to you too! Safe travels. Thank you. A very Happy Christmas to you from Brazil. And thank you for all the wonderful things you have give to all of us! A very merry Christmas to you. Thank you for a wonderful year of information and fun. I am so looking forward to spending another year with you here. Enjoy your day. Thank you for your warm and special message. Keep happy, well and safe. The very best of Christmas Greetings go your way from here tonight, where it’s already into the very early hours of Christmas day. Merry Christmas and thank you for the wonderful posts. From London may I wish you and your family a blessed Christmas and may the blessing of our Lord Jesus be upon you and your family, happy Noel, enjoy yourselves you deserve a rest and Merry Christmas to you. God Bless. Merry Christmas to you, Mrs. Corbet! I still have not looked at that e-mail you said that you sent me. Since it’s my mom’s e-mail, I have to have her open it, and we just haven’t had time! (I don’t have my own e-mail, I’m only ten!) Sorry. I just wanted to say I’m very impressed that you are using Mary Corbet’s site for embroidery. I was about your age when I used my older sister’s embroidery book and taught myself several stitches. Isn’t it grand that Ms. Corbet has so many teaching videos and stitch instructions for us? My best wishes to you and your Mom for a very Merry Christmas! Merry Christmas to you and yours, Mary! Thank you for all the wonderful things you’ve posted throughout the year. Love it all! And the very happiest of Christmas wishes to you and your loved ones too Mary. Enjoy your time with them to the fullest. Thank for your Christmas wishes Mary and I hope you have a great Christmas and all the best for 2014. And a very Merry Christmas from the cold North (that’s not so cold right now due to unseasonably warm weather)! And a very Happy New Year! Merry Christmas to you Mary! Thanks again for all the great ideas, reviews & stuff on your blog this year. In many ways, it will be a Merry “Mary” Christmas for all of us out here. Merry Christmas Mary! Thank you for all of your hard work year around for me to enjoy on your site. I share it with everyone I know! Wishing you a very happy Christmas Mary filled with joy and peace. Merry Christmas to you Mary, and your family. Enjoy your time together and may love, joy, and laughter fill all your holidays! Happy Holiday Season from South Africa. Hoping that you traveled safely and had good time with family and friends. May 2014 bring you peace and joy. A very Blessed Christmas to you and your family, Mary. Thank you for everything you share with us. You are a constant inspiration to try new things and be the best we can be, whatever skill level we are. I love each day opening the email and seeing what you have in store for us. Such wonderful variety! Thank you so much and may 2014 be a creative year for all. Thank you for all the tips, hints, reviews and projects you’ve shared this year. I wish you a wonderful christmas ! Merry Christmas from Portugal. Kisses. I hope your Christmas was wonderful in every way! I was thrilled to get the Lacis tambour needle set as a present from my husband. Bless his heart, he hadn’t a clue what sort of gadget it was that I was asking for but that didn’t stop him! Now I’m looking forward to some free time to dig out fabric and threads to start playing. Thank you for being such a lovely source of information and inspiration. I’m happy every day that I discovered your blog and can’t wait to see what you’ll have for us next year! Compliments of the season, Mary. May the good cheer last all year thro. Thank you so much Mary! Wish you a Merry Christmas Season to you and your Family! I am only a tad behind the times. Nonetheless I hope your Christmas was wonderful and that your New Year will be just as happy, as will the year ahead. Is this photograph of your actual house? It’s lovely; I think the California bungalow is one of the best ever housing styles. We have one too – it was a style that transferred from America to Australia very successfully. Next Next post: This is Not an Embroidery Book … Or is It?